In the Interact study “Making the most of macro-regional strategies”, amongst others, Nordregio researchers discuss the governance of maritime spatial planning and tools to monitor and evaluate territorial development. The concept of macro-regional strategies has emerged in 2009 with the EU Strategy for the Baltic Sea Region and it spread to three other regions: the Danube, the Adriatic and Ionian and the Alpine regions. Since the start of the macro-regional endeavour, research has played a crucial role in shaping a discourse and practice that can be considered as a completely new feature of EU integration and provides an innovative approach towards cooperation and territorial cohesion. 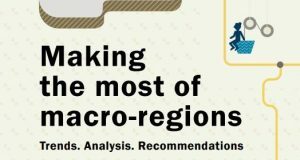 The booklet “Making the most of macro-regional strategies” intends to take stock of this development and its multifaceted aspects. It covers a wide range of topics, such as the involvement of regional parliaments in macro-regional strategies, general aspects of governance, policy integration, cross-sectoral cooperation, as well as monitoring and evaluation of macro-regional strategies. In addition to these horizontal aspects, a specific project example in the Baltic Sea Region illustrates how to overcome challenges in governance and stakeholder engagement.